A communication partner facilitates an exchange of communication between themselves and the AAC user. In normal verbal communication, participants exchange conversation without prompting. In contrast, an AAC user requires support and understanding to communicate effectively with others. The communication partner is there not only to communicate with, but also to aid and support the AAC user. Talking with someone who uses AAC for the first time can seem a daunting process. Thoughts such as 'Will I understand them? ', 'Will they understand me? ', 'What will I do if it all goes wrong?' are all too common. It is therefore vital that an environment is in place that fosters communication. Find a quiet environment with minimal background noise so you can concentrate on the conversation. Face the person you are talking with – we all find it easier to communicate naturally when we can pick up visual clues like body language, gesture and facial expressions. Everyone communicates in a different way – this is exactly the same for someone who uses AAC. Start off by asking if there is anything specific that they need to help them to be successful in this interaction. Before starting a conversation be aware that, however brief the interaction, you will need more time than you would with a speaking person. Be prepared to give that time. When you ask a question always wait for a reply. A good start to the conversation boosts everyone's confidence. 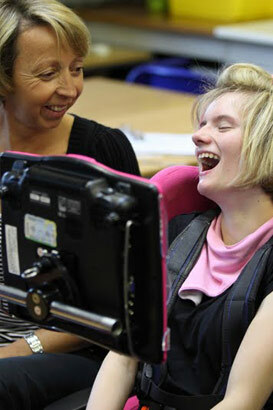 Make eye contact and speak with the person (not their assistant) using AAC. 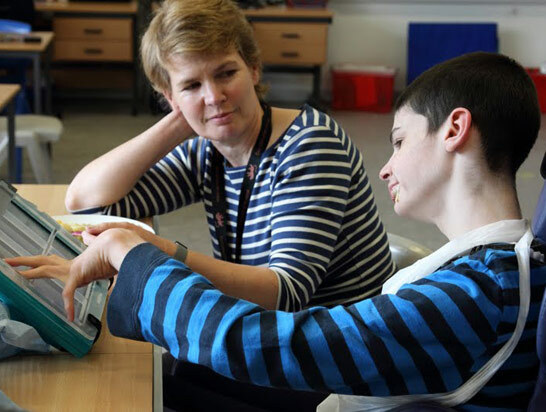 If you are new to conversing with an AAC user, then let them know – often they will be patient and assist you the best they can. Start with concrete subjects such as the current situation you are both in. Keep your utterances short and simple. This will help the AAC user to process, understand and respond. Try not to ask closed questions (ones that require 'yes' and 'no' answers) as they do not encourage/stimulate conversation. It is tempting to speed up communication by finishing off the person's sentence for them. Avoid this as this is where misunderstandings start. It can also be extremely frustrating for the other person. Take time to make sure you have understood the person using AAC correctly by rephrasing their response. As the pace of interaction is slower it helps to introduce one topic of conversation at a time. Be clear when you are changing the topic; the user might miss subtle clues from your face as they look down at their AAC system. It is much harder for someone using AAC to interject in a conversation. They will appreciate it much more if you take the time to invite questions; as opposed to expecting them to pose questions. Asking questions is a vital part of conversation. Open questions are the best route (those starting with 'who', 'what' 'where', 'when', 'why', 'how' and 'if') and will elicit a more detailed response. What situation are we talking about? When did the situation being talked about take place: in the present, past or is it still to take place? When the flow of conversation is interrupted or slow, it can feel like hard work. This can lead to fatigue and loss of concentration. This is more likely to happen to you than the person who uses AAC, as they are used to conversations being this way. It is perfectly acceptable to ask them for a break, but if the conversation has not concluded, then it is only polite to say that you will return to finish it. Some people who use AAC, find using their system tiring and will need a break before the end of the conversation. If you sense they are getting tired, suggest a break. Most of us start to end conversations using non-verbal clues: looking away, fidgeting, etc. Remember, the person using AAC may not see these clues as they will need to look down at their system. As with all new ways of communicating, practice makes perfect. The more you engage with people who use AAC, the better you will become. Remember, people who use AAC want to communicate. They understand the difficulties in doing this, know the obstacles that you face and will want to do all they can to communicate with you. 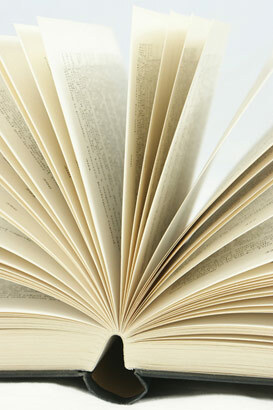 The leaflet 'Focus on... Speaking with someone who uses AAC, offers detailed advice on effective conversation with someone with AAC. In the document 'Introduction to Module (F)', a particular focus is placed on those interventions that are used to enable children with SLD, PMLD and CLDD to communicate more effectively. Problems viewing video whilst online? Problems viewing video whilst online may be the result of controls on the network you are using to access the SALT materials. Should problems viewing video persist, it is recommended that users download the video using the link provided. Problems viewing video whilst offline? If you are using Firefox or Internet Explorer, you may find that some video resources will not play in your browser when you’re working offline. We’ve supplied a link with each video to open it in your default media player if this happens. The mp4 videos on this site are not compatible with older versions of Windows Media Player. If you want to watch the videos offline, please download an alternative such as QuickTime or RealPlayer, and set this as your default media player. You will also need to do this if you want to download videos from the materials’ ‘Further reading’ area. Alternatively, you may choose to work through the materials in Chrome or Safari.